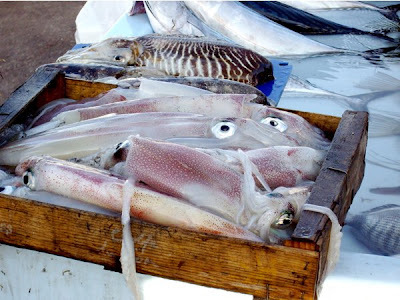 Enjoy - Food & Travel: What is the catch of the day - monsieur? Every early morning at Vieux Port in Marseilles fishermen come in with the catch of the day to sell to those planning today's lunch or dinner. As I am early to rise in the morning, and love food shopping, I was out two mornings to see what the fishermen had caught. 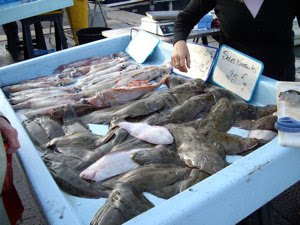 The amount and selection of fish were in grim contrast to the abundance of the markets of Barcelona. Here are a few varieties I recognized and that I may have bought and prepared that day. As this Dorade or Gilt-head bream for sale at € 8 a kilo. It is found throughout the Mediterranean and even at the North Eastern coastal areas of the Atlantic ocean. 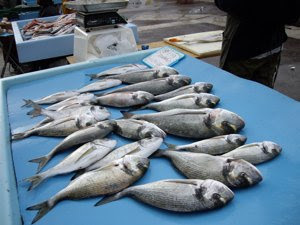 It is an excellent fish to prepare for a delicious lunch as you overlook the Vieux Port in Marseilles. Very popular in Portugal, and if you ask for Dourada at any restaurant along the Algarve coast you will served this one. Mackerel? They certainly look like them! There are so many varieties of mackerel. 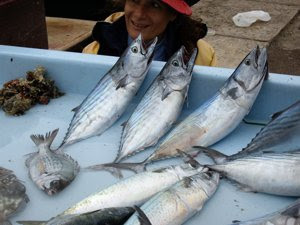 From the large tuna fish, to the smallest mackerels that swim in large numbers to the coasts of Scandinavia. These fish look unmistakably like mackerels. The stripes, the small fins on their backs and the shape of their tails. I bet they would be delicious, fileted, lightly covered in flour and pan fried, like the freshly caught mackerels where I come from. I love sole. I ate sole meuniere at the Restaurant Versailles at the Blue Waters hotel in Durban, that did not do it much honour, but I found a great place to eat plaice at Lizard's Rock in Pietermaritzburg. The sole meunière, lightly floured, butter fried sole with parsley and lemon - in this dish the fish plays the main character and the delicious flavours do not have to compete too many other tastes. But it does not come cheap. € 25 for a kilo., but it is definitely worth it!!! Interesting to see the contrast with Barcelona. Why such a marked difference, do you think? This is an interesting question. Barcelona has a number of very impressive food markets, e.g. the market at Las Ramblas described earlier on Enjoy Food & Travel. The catch of the day in Marseilles was an entirely different matter -a small scale enterprise. I did however find impressive food markets In Marseilles. In Rue Longue de Capucins there were a number of mainly Arab butchers and green grocers, and in one side streets I found smaller markets offering a wider range of delicious products from the Mediterranean. I did, however, find the the small scale fish mongers at the harbour very charming, and would, if I had a flat there buy the fish directly from the boats, as it guarantees a fresher and better product. Keep up the good work with the blog... it's a great read. Thank you - if you have any contribution to Enjoy Food & Travel - let me know.